The American Disabilities Act (ADA) describes a disabled person as someone with a physical or mental impairment that substantially limits one or more major life activities; has a record of such impairment; or is regarded as having such an impairment. Therefore, one doesn’t have to lose a limb to be disabled. Having musculoskeletal and cardiovascular disorders can also keep your employees from being able to participate in certain activities. Fortunately, as a result of medical advancements and current laws that protect those with disabilities, people who are disabled can contribute to the working population and the business community—with less risk of facing discrimination due to disability. However, a recent poll by the National Public Radio, the Robert Wood Johnson Foundation, and the Harvard T.H. Chan School of Public Health found that a majority (55 percent) of disabled workers in America think that the workplace provides a poor work environment for them, compared with 21 percent of the non-disabled workers that feel the same way. This means that, despite being accepted, we’re not treating people with disabilities fairly if the physical office is not inclusive or fit to them. Now, how many of your employees have some form of disability? What do they feel when they go to work? Is your office helping them, or is it hurting them? Dr. Rosemarie Rossetti, a world-renowned speaker and advocate for people with disabilities, believes that a disabled person’s environment plays a big role on how they will reclaim a positive outlook on life. In one of her interviews with Contractor Magazine, she talked about how “universal design” makes spaces inclusive for people with disabilities. Dr. Rossetti believes that universal design wouldn’t intensify the difficulty faced by people with disabilities, because it benefits a wide range of people in different situations. “Universal design is all-inclusive for all people and all concepts,” she said. Is the workplace for equitable use? It must be fair to people with diverse needs, from the entrance to the office tables. Are the facilities flexible to use? Everything in your office space should accommodate a wide range of preferences and abilities. Is the design simple and intuitive? The design must be easy-to-understand, regardless of the user’s experience, knowledge, or skills. Does everyone perceive the message you want to convey? Necessary information should be communicated to all users, regardless of their sensory limitations. Is it tolerant of error? Any unintended action must not lead to hazardous accidents. Do you exert low physical effort in using your facilities? Everything should be able to be used with minimal effort. In your office bathroom, for example, the faucets and the flush must be easy to use. Does the size and space respect the diversity of employees? A person in a wheelchair must be able to pass through any hallway and doorway in your building. The design must cater everyone, regardless of their stature and mobility. An ergonomic office is a safe office for everyone. Proper office ergonomics is a part of universal design as well. Ergonomics deals with designing and arranging things so that people can use them easily and safely. Employing ergonomics makes sure the work environment fits the worker—not the other way around. It is the key to a more comfortable working environment, that is equitable to people with or without a disability. Professor Alan Hedge from Cornell University dedicated his career to informing people and institutions about proper office ergonomics. Find a good chair that is supportive, adjustable, and fits your desk. Its back must have neck and lumbar support. Avoid putting your computer at eye level. Instead, keep it two or three inches higher to avoid a hunched back. Keep your feet flat on the floor so your body is stabilized at work. Use a footrest if you can’t reach it. Relax your arms and elbows and keep your wrists flat. Slope your keyboard downward to achieve a more natural position for the wrists. Avoid repetitive motions by taking short breaks. These rules are meant to save a person from excruciating neck and back pain. In addition, these can reduce anyone’s risk of developing musculoskeletal disorders such as carpal tunnel syndrome, tendonitis, and bursitis—the National Institute of Neurological Disorders (NINDS) found that these disorders develop when you do repeated motions in the course of normal work. In addition, proper lighting and noise control are as important as getting the right chair and desk. Safe Work Australia, an institution that ensures protection of Australian workers, says that it is necessary to consider lighting and noise control in the office environment, as failure to do so may lead to blurry vision and gradual hearing loss. To protect your employees’ eyes, at Superdraft Pty. Ltd we recommend installing full-spectrum lighting in the office, apart from the task of lighting each desk. Full-spectrum lights improve a person’s color perception, visual clarity, mood, productivity, and mental awareness—similar to what sunlight does to humans, animals, and plants. To reduce distracting noise, we suggest installing surfaces and materials that absorb and block sound, such as acoustic ceiling tiles, carpets, or panels. Controlling noise in the office helps your employees achieve greater concentration. In fact, HealthcarePapers found that controlling distracting noise can help employees with Attention Deficit Hyperactivity Disorder (ADHD) focus better on their daily tasks. At the end of the day, ergonomics should always be prioritized in the office, for the wellbeing of all employees. As the employer, you are capable of establishing office ergonomic health and safety rules that the employees can participate in. According to the American Institute of Architects in Portland, Oregon, architects are among the most progressive of all professionals when it comes to promoting inclusion and respect for the individual. “They are genuinely interested in going beyond mere code compliance and would see such enhancement as another opportunity for better design,” the institution said in a press release. Working at an architecture company, I gained knowledge on how designers and builders work together with small to medium-sized business owners in achieving embracive, human-centered office spaces. At Superdraft, we understand that the greatest driving force of any business is their workforce, and it reaps good if they feel valued. After all, your employees are working alongside you to achieve your company’s ambitious goals. 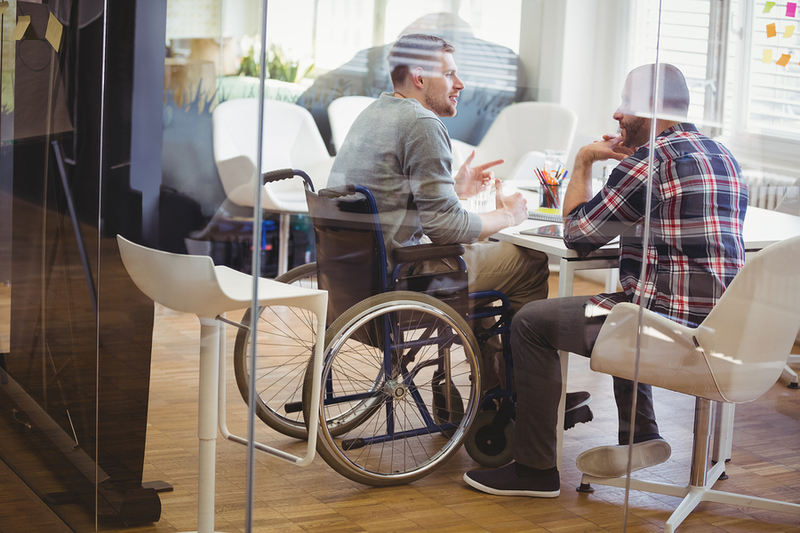 Providing a sense of belonging in the office to both your employees with and without disabilities creates an environment where everyone can continue expressing their talents to the fullest extent. Charlene Ara Gonzales is a young, savvy design writer. She does content marketing and SEO for Superdraft Pty. Ltd., a company that provides architectural and drafting services in Australia.